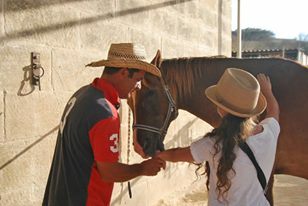 Dreams Of Horses Farm is the pioneer in Gozo & Malta for Equine Assisted Learning (EAL). assisting to promote the improvement of the quality of life of individuals that are experiencing difficulties physically, mentally or emotionally and guiding them in correct human-animal interaction. Educational packages available for schools, associations and business's that are designed specifically for their requirements that help promote team-building within the group. Also available here at the farm equine related activities such as horse riding and Carriage driving. We offer tailored packages for groups and families to have fun and to enjoy directly on the farm and in the surrounding area. Prices include coffee break with light refreshments. ﻿​Educational packages for children and adults. ​Fun tailored packages for groups and families suitable for all. Therapy packages for Equine Assisted Learning.